Several pieces of my art are on exhibit at the Pomerene Center for the Arts in conjunction with my residency. In the gallery next to the one showing my art is an exhibit by an artist named Melissa Vogley Woods. This is a piece of her art. In a third gallery there is an exhibit of quilts by local quilters. I enjoyed the combination of all three galleries and their variations on art involving fabric and memories. 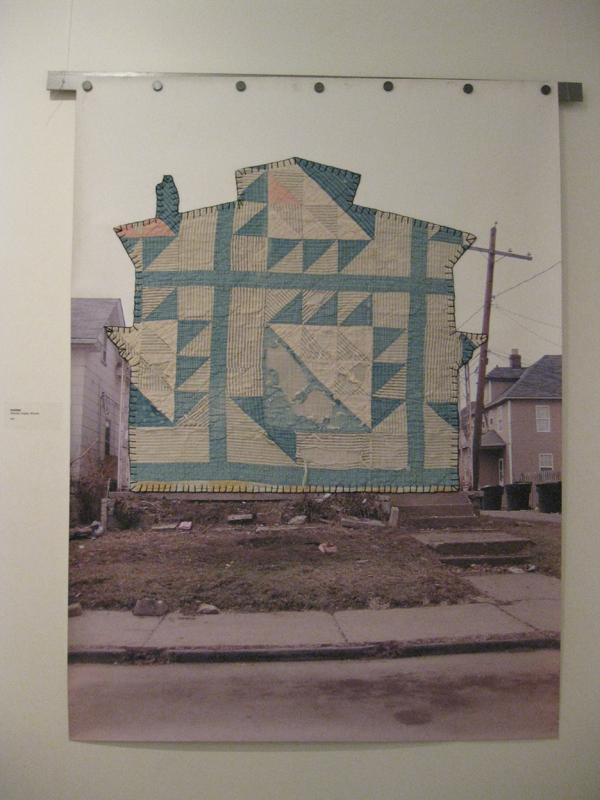 I liked Melissa Vogley Woods’ art reflecting on empty houses, including photos like the one above where she has mended the empty house with old quilts. I like her process as a way of interacting with a neighborhood like the one where I live in with its empty houses that disappear to the demolition crew in a day. How do you heal the houses? How do you heal the neighborhood? What memory does the neighborhood have after a house is gone after having stood for more than a century?